So I'm having trouble getting this new patch to work. I've downloaded it, moved bg2 into the sourcemods folder and still haven't gotten it to work. Think the code of the mod is completely buggered atm as my BG doesn't work either, neither 2.2 or 2.3. ItzPrescripZion wrote: So I'm having trouble getting this new patch to work. I've downloaded it, moved bg2 into the sourcemods folder and still haven't gotten it to work. Make sure you merge/overwrite all the files once you're extracted the patch to your bg2 folder. Yeah I managed to get the game name changed in the steam menu to 2.3 but still gives me the same error (classes differ from server or tables differ from server) forget which one exactly. Even un-installed and re-installed both and went through all the steps again as well still no luck. so i tried downloading the patch today, and you know I know my stuff I know where to extract it to, i restarted steam and still its bg2.2.2 can anyone explain?? and when i extract the patch files to the games directory i dont get a option or a pop up asking me if i want to merge or overwrite it just goes right and thats it. someone help. drugbugz wrote: so i tried downloading the patch today, and you know I know my stuff I know where to extract it to, i restarted steam and still its bg2.2.2 can anyone explain?? and when i extract the patch files to the games directory i dont get a option or a pop up asking me if i want to merge or overwrite it just goes right and thats it. someone help. so what I did is downloaded bg 2.2 into just the steam folder not the apps or sourcemods subfolders. then downloaded the update,transfered the bg2 file into the sourcemods folder, restarted steam and that got it working somewhat. The main menu works but no servers pop up and if you do the create a game the map won't download. So it appears the patch itself is having issues but that could just be me. 3. 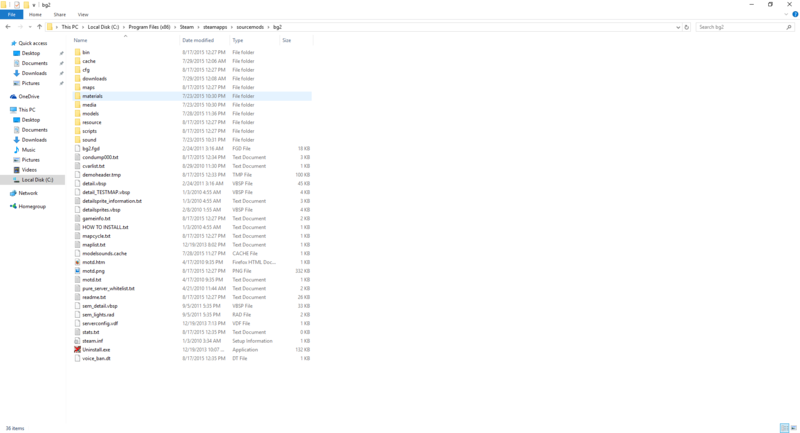 Download and extract the patch to (...\Steam\SteamApps\SourceMods) folder, overwriting the bg2 folder that is there. 4. Restart Steam and check your library. I'm sorry if this seems redundant but all of the needed files are in the installer or patch, the steps must be done correctly if you want the mod to work. If all of those steps have been done correctly then we can start trouble shooting for other issues. Tried the whole process over again making sure I had all the requirements and followed the process and Now I'm getting hit with a "missing exectuable". Can't even start the old 2.2 mod now. I will note that when I extracted the 2.3 files to the bg folder it didn't say it was overwriting the file. Ok so your sourcemods folder has "bg2" in it like this? And inside bg2 it looks like this?